You can download the sketch from here. To get it running you have to download and install the Centipede Shield library. You do not need the shield itself necessarily, but it make things easier if you don’t want to wire it up manually with 4xMCP23017. The sketch does not include the code for the analog multiplexer/demultiplexer shield as it makes things too complicated. This is about touch sensing, so we’ll keep it as simple as possible. The 3 x CD74hc4067’s come as an ready to use Arduino Shield produced by mayhewlabs.com (http://mayhewlabs.com/products/arduino-mux-shield). My version is an older version. A newer shield is available which is from 2013. We used the old version because it was part of my old YAAMIDrum project from 2012. So dust was removed from the shield and reactivated to become a part of the new TouchDuino XL. 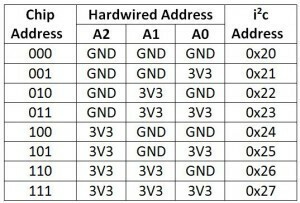 The special thing about the digital inputs is the fact that they are used to trigger not only bit values (on/off) but they return values from 0-127 that can be used to do several things. E.g. you can use these values to change the volume of a midi tone. Or you can use it to pitchbend the sound. There are a lot of possibilities. http://docs.macetech.com/doku.php/centipede_shield where you can buy a ready to use arduino shield to get hings running very quickly. We used this library to avoid writing things twice. You can find example code on their website that shows how to use this excellent lib. You need to make your fingers wet (with water or best and cheapest with your own saliva). Then put one wire to ground and hold it in one hand. 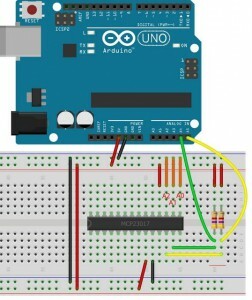 With a wet finger of your other hand touch a paperclip and you can read the measured value from 0-127 on the serial monitor of the Arduino IDE. Set the DEBUG value in the sketch to 1 for debugging and printing these values out to serial line. Turn off the internal pullups of the MCP23017, map the values the other way round and you are done. 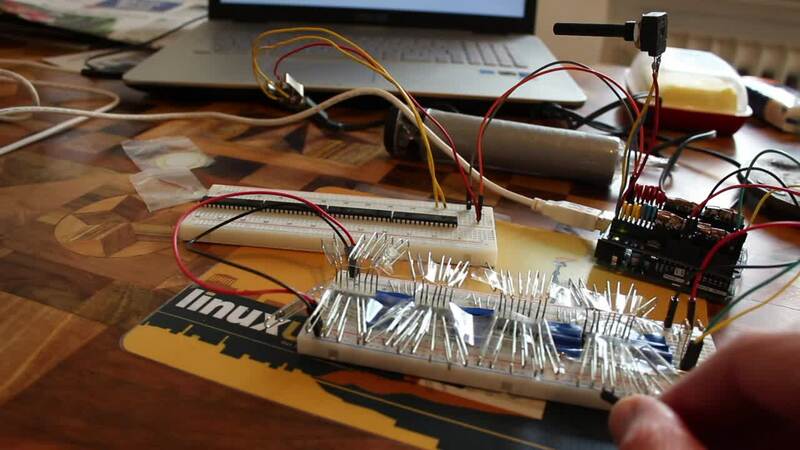 The disadvantage: If you ever connect any active sensor to on of the inputs/paper clips the possibility that you damage the IC or the Arduino is more than high. Be careful. Download the modified version directly from here. Great work! But how can the expanded digital inputs send back values (not just HIGH/LOW)? Please download the sketch, wire up 4x MCP23017 correctly, download the Centipede library and install it. See source code for details. You can download it now from the website. Update: There is a new 2nd video showing how to get values from 0-127 from each digital pin. The method described there is a little bit ,nah… let’s say: „unconventionel“. Cool, thanks for the additional update! yes, you are right. So here is my official contact site.